The Family Check-Up is a brief, strengths-based intervention model for children ages 2 through 17. It promotes positive child outcomes by improving parenting and family management practices. The Family Check-Up has more than 30 years of evidence demonstrating strong intervention effects. The Family Check-Up is for any parent or any provider working with parents. The model has been used successfully in diverse service settings, including community mental health agencies, publicly funded health centers, public schools, hospitals, university clinics, and Native American tribal communities. Click on the links below to learn more about the Family Check-Up. The Family Check-Up model gathers information from families and helps them to set intervention goals. 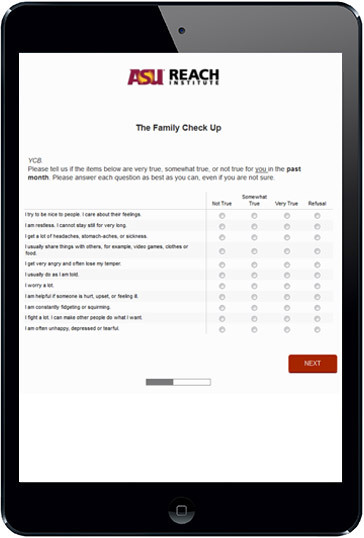 Web-based assessment tools and other technological supports make it easy for providers to use the Family Check-Up. A Brief Intervention with a Big Impact!